Famous both in the local market and overseas, Natura Siberica is a top quality brand definitely worth shopping for. Natura Siberica takes Siberia as an inspiration for their products. The brand is organic-certified, emphasizing all natural and organic approach in everybody care, hair care, and skin care products they offer. Natura Siberica uses flowers and herbs growing wildly in Siberia. 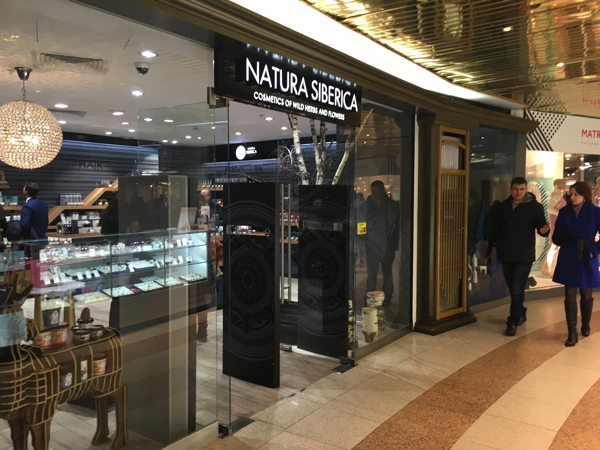 Natura Siberica opens official stores in big cities in Russia such as Moscow and St. Petersburg. Their products are wildly popular so expect the stores to be packed with customer most of the time. Tourists like to bring back Natura Siberica products as souvenirs, and you should too. Purchase their caviar lines and enjoy better and more beautiful skin. If you’re confused over what product to buy, Natura Siberica’s salespeople will gladly help you. Natura Siberica shops are famous with their best service, customers love to spend time there for their friendly atmosphere. Shopping is easy and enjoyable. The packaging of the products also comes with English label so you don’t have to translate from Russian. The UK cosmetics retailer opened several stores in St. Petersburg. The company itself is well-known for their bath products. In their stores, the assortment is all of high quality. Products are displayed in a very interesting way. They display soaps in market boxes like when you sell fruits! There’s a large ice box (the one people use on fish markets) where bowls of samples are displayed. They have a very interesting concept in displaying their product, it’s just fun to look around. Customers are allowed to try samples for almost every product. If you’re confused, there are attentive consultants who would help you pick the best product for you. Lush in St. Petersburg is located at Nevsky Prospect. It’s certainly easy to find since it’s located in a popular street. Drugstores are your quick go-to if you want to find something affordable and quick. Forget bringing sunblock for your beach vacation? or looking for an eyeliner? Go to drugstores such as Watsons. The famous drugstore chain owns a number of branches at the city of St.Petersburg. You can practically find them on every corner of the city. Ile de Beaute is the Sephora of St. Petersburg. The large Russian perfumery chain is acquired by Sephora more than a decade ago in 2008. Now they are 125 stores spread all over Russia, mainly concentrated in big cities. Sephora owns 65% of Ile de Beaute’s shares. in St. Petersburg, you can find ile de Beaute at mall Atlantic city and river park mall. you will instantly feel the familiar Sephora-esque atmosphere as you entered ile de beaute establishment. The lighting is bright and the placement of the products are tidy and elegant as usual. You can find your favorite international brands here such as Make Up Forever and The Balm. Rive Gauche is another popular cosmetics retailer in St. Petersburg. There are plenty of Rive Gauche branches scattered around this historical city. If you want to go to the biggest one, go to the main store at Nevsky Avenue. This branch has one of the most complete makeup collections in the city. You can easily lose track of time when browsing the beauty assortment this store has. Consultants ready to help to find the product you’re looking for. The assortment is very diverse, from cheap to medium to luxury. You will always find what you want here. Customers also love Rive Gauche for the discount the store offers. Even if there isn’t any sale, many products here are quite affordable already. Apart from Natura Siberica, Organic Shop is another store specializing in organic beauty stores. What distinguishes Organic Shop to Natura Siberica is that the former sells products from various brands. Enjoy a large assortment of the local brand such as White Aagafia. The store also sells products from overseas. There are still many other local organic brands made in Russia. Organic Shop is your destination if you want to buy cosmetics for souvenirs. They have a huge store in Galleria Shopping Mall, St. Petersburg. Do not hesitate to ask help from the salespeople. Prices are also affordable, you can buy in bulk without having to empty your wallet. All natural beauty product is a growing trend among Russian women. It is understandable because women are more and more aware of the danger of putting too many chemicals in their body. Ekomagazin Green knows this. Their store adds to the list of the cosmetics store selling all natural products. Apart from cosmetics and beauty care, the store also sells spices, cereal, and other all natural food. The last of the list of 8 affordable cosmetics shops in St.Petersburg, L’etual is by any means the least. The retailer chain has plenty of stores all over Russia. You could easily find the store in any famous spot in the city. One of the most popular branches is the one in Galleria Shopping Mall. L’etual’ offer a wide range of cosmetics product both local and international. The price category here is on affordable to medium range. Those are 8 affordable cosmetics store in St. Petersburg. Before shopping, check out some Russian women beauty tips. The information will help you find the best products you need for your body, skin, and hair.